20 November 2018 – Overall support for the euro remains at its highest since surveys began in 2002 for the second year running, the latest Eurobarometer survey shows. A majority of citizens continue to support economic reforms and using rounding to do away with one- and two-cent coins. A majority of 74% of respondents across the euro area said that they thought the euro was good for the EU. This is the same as the record high score set last year and confirms that popular support for the euro is at its highest since surveys began in 2002. By contrast, 15 % of respondents said that the euro was bad for their country, a decrease of one percentage point. 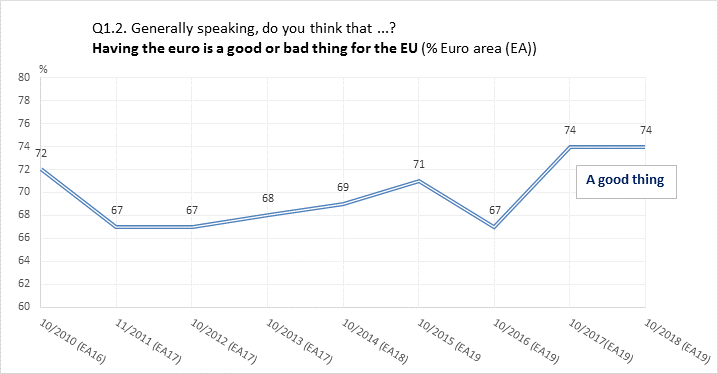 A majority of 64% of respondents across the euro area also said that they thought the euro was good for their own country. This confirms last year’s score of strong support as the highest since the surveys began in 2002. By contrast, 25 % of respondents said that the euro was bad for their country, the same as in 2017. A majority of respondents supports the euro in all 19 euro area countries, although there are significant differences. Support for the euro was again highest in Ireland at 85%, followed by Luxembourg at 80% and Austria at 76%. Asked about their views on whether euro area coordination of economic policy, including budgetary policies, is appropriate, 69% of respondents across the euro area said that they saw the need for more coordination, while 7% said there should be less. There is also continued strong support (78%) across the euro area for economic reforms to improve the performance of national economies. This is also reflected in all national results with clear majorities in all euro area countries. While a majority of 63% of respondents across the euro area said there was just the right amount of euro coins, a majority of 64% said they were in favour of abolishing one- and two-euro cent coins through mandatory rounding (up or down) of the final sum of purchases in shops and supermarkets to the nearest five cents. By contrast, 33% (-3pps.) are against the idea. In 16 of the 19 euro area countries, an absolute majority supports this idea. Citizens replied to a set of questions focusing on issues ranging from perception and practical aspects of the euro to their assessment of the economic situation, policy and reforms in their country and in the euro area. In addition, citizens were asked about their views and expectations regarding household income and inflation. Some 17 500 respondents across the 19 euro area countries were interviewed by phone on 15 – 16 October 2018.